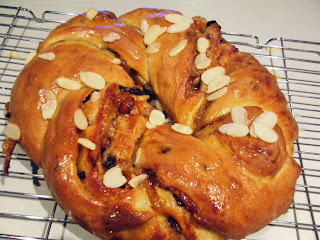 Apricot Couronne (couronne is French for crown) tastes like Christmas. 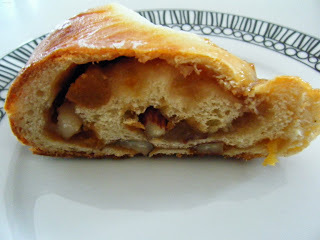 I didn't think I'd have time for a Bake Off post this week as we are going to Belgium tomorrow morning. When I returned home from work on Saturday evening I discovered that Trevor had been baking. Not just any baking either, he had a surprise, he'd made me the technical bake from this weeks show so I could write this Bake Off post for you. Isn't he amazing! The apricot couronne is not a simple bake either but dough is most definitely Trevor's forte, apparently the intricate shape was easy (I'm not sure I could manage it). He tells me there was a smoky moment when some sweet filling dripped onto the bottom of the oven and burned but other than that the bake all went according to plan. He added brazil nuts and almonds instead of walnuts because these were the nuts we had in the cupboard, the results are quite spectacular and the fruity marzipan mix tastes just like a slice of Christmas. Because of the way the crown is rolled every bite is filled with flavour and the finished look is so impressive, you could easily have this instead of a Christmas cake. Trevor was following the full recipe from Paul Hollywood's book How To Bake the contestants on tonight's great British Bake Off didn't have that luxury they didn't use marzipan either. This week started with tea loaves nearly all of which were under proved and under baked, Mary stated that they should have gone for smaller loaves due to the time restrictions. This made me wonder what kind of guidelines the contestants get, why did they all go for large loaves? It was Howard that left the Great British Bake off, I did think his peachy buns were beautifully presented but like Frances previously Paul and Mary called him on style over substance. Ruby took star baker which may just give her a good confidence boost. Next week is pastry just as well because Twitter went into meltdown with all the innuendo flying around tonight. Mummy Mishaps and The Crazy Kitchen host the great bloggers bake off, pop over and check out some other great bakes from the blogging community.